For the helicopter, see Sikorsky R-4. 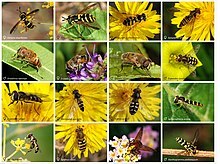 Hoverflies, sometimes called flower flies, or syrphid flies, make up the insect family Syrphidae. As their common name suggests, they are often seen hovering or nectaring at flowers; the adults of many species feed mainly on nectar and pollen, while the larvae (maggots) eat a wide range of foods. In some species, the larvae are saprotrophs, eating decaying plant and animal matter in the soil or in ponds and streams. In other species, the larvae are insectivores and prey on aphids, thrips, and other plant-sucking insects. Aphids alone cause tens of millions of dollars of damage to crops worldwide every year; because of this, aphid-eating hoverflies are being recognized as important natural enemies of pests, and potential agents for use in biological control. Some adult syrphid flies are important pollinators. About 6,000 species in 200 genera have been described. Hoverflies are common throughout the world and can be found on all continents except Antarctica. Hoverflies are harmless to most other animals, despite their mimicry of more dangerous wasps and bees, which wards off predators. The size of hoverflies varies depending on the species. Some, like members of the genus Baccha, are small, elongated, and slender, while others, like members of Criorhina, are large, hairy, and yellow and black. As members of the Diptera, all hoverflies have a single functional pair of wings (the hind wings are reduced to balancing organs). They are brightly colored, with spots, stripes, and bands of yellow or brown covering their bodies. Due to this coloring, they are often mistaken for wasps or bees; they exhibit Batesian mimicry. Despite this, hoverflies are harmless. With a few exceptions (e.g. ), hoverflies are distinguished from other flies by a spurious vein, located parallel to the fourth longitudinal wing vein. Adults feed mainly on nectar and pollen. They also hover around flowers, lending to their common name. The abdomen and thorax often have glossy cuticular body surfaces, abdominal colors are usually mainly due to cuticular pigments (bee flies are usually very hairy, their abdominal colors are almost always due to pigmentation of hairs and not the underlying cuticle). Unlike adults, the maggots of hoverflies feed on a variety of foods; some are saprotrophs, eating decaying plant or animal matter, while others are insectivores, eating aphids, thrips, and other plant-sucking insects. This is beneficial to gardens, as aphids destroy crops, and hoverfly maggots are often used in biological control. Certain species, such as Lampetia equestris or Eumerus tuberculatus, are responsible for pollination. An example of a well-known hoverfly maggot is the rat-tailed maggot, of the drone fly, Eristalis tenax. It has a breathing siphon at its rear end, giving it its name. The species lives in stagnant water, such as sewage and lagoons. The maggots also have a commercial use, and are sometimes sold for ice fishing. On extremely rare occasions, hoverfly larvae have been known to cause accidental myiasis in humans. This occurs when the larvae are accidentally ingested from contaminated food. Hoverflies are a cosmopolitan family found in most biomes, except deserts, tundra at extremely high latitudes, and Antarctica. Certain species are more common in certain areas than others; for example, the American hoverfly, Eupeodes americanus, is common in the Nearctic ecozone, and the common hoverfly, Melangyna viridiceps, is common in the Australasia ecozone. About 6,000 species and 200 genera are in the family. While some hoverfly larvae are aquatic and are often found in stagnant water, those of species which prey upon aphids and other plant pests are usually terrestrial, residing on leaves. Adults are often found near flowers, their principal food source being nectar and pollen. Some species are found in more unusual locations; for example, members of the genus Volucella can be found in bumblebee nests, while members of Microdon are myrmecophiles, found in ant or termite nests. Others can be found in decomposing vegetation. Hoverflies are important pollinators of flowering plants in a variety of ecosystems worldwide. Syrphid flies are frequent flower visitors to a wide range of wild plants, as well as agricultural crops, and are often considered the second-most important group of pollinators after wild bees. However, relatively little research into fly pollinators has been conducted compared with bee species. Bees are thought to be able to carry a greater volume of pollen on their bodies, but flies may be able to compensate for this by making a greater number of flower visits. Like many pollinator groups, syrphid flies range from species that take a generalist approach to foraging by visiting a wide range of plant species to those that specialize in a narrow range of plants. Although hoverflies are often considered mainly nonselective pollinators, some hoverflies species are highly selective and carry pollen from one plant species. Cheilosia albitarsis is thought to only visit Ranunculus repens. Specific flower preferences differ between species, but syrphid fly species have repeatedly been shown to prefer white- and yellow-coloured flowers. Nonvisual flower cues such as olfactory cues also help the flies to find flowers, especially those that are not yellow. Many syrphid fly species have short, unspecialized mouth parts and tend to feed on flowers that are more open as the nectar and pollen can be easily accessed. Also, a number of fascinating interactions occur between orchids and hoverflies. The orchid species Epipactis veratrifolia mimics alarm pheromones of aphids to attract hoverflies for pollination. Another plant, the slipper orchid in southwest China, also achieves pollination by deceit by exploiting the innate yellow color preference of syrphide. More than 40 species of syrphid flies are found in New Zealand in a variety of habitats, including agricultural fields and alpine zones. Two hoverfly species in Switzerland are being investigated as potential biological control agents of hawkweeds in New Zealand. Native hoverfly species Melanostoma fasciatum and Melangyna novaezelandiae are common on agricultural fields in New Zealand. Coriander and tansy leaf are particularly attractive to many species of adults, which feed on their pollen. In organic paddocks, hoverflies were found to feed on an average of three and a maximum of six different pollens. M. fasciatum has a short proboscis, which restricts it to obtaining nectar from disk flowers. Syrphid flies are also common visitors to flowers in alpine zones in New Zealand. Native flies (Allograpta and Platycheirus) in alpine zones show preferences for flower species based on their colour in alpine zones; syrphid flies consistently choose yellow flowers over white regardless of species. However, syrphid flies are not as effective pollinators of alpine herb species as native solitary bees. Many species of hoverfly larvae prey upon pest insects, including aphids and the leafhoppers, which spread some diseases such as curly top. Therefore, they are seen in biocontrol as a natural means of reducing the levels of pests. Gardeners, therefore, sometimes use companion plants to attract hoverflies. Those reputed to do so include alyssum, Iberis umbellata, statice, buckwheat, chamomile, parsley, and yarrow. Fredrik Sjöberg's book The Fly Trap concerns his enthusiasm for hoverflies on the island of Runmarö in the Baltic Sea. The island is a hotspot for hoverflies and other insects; Sjöberg has collected 58 species of butterfly there, and (in seven years of hunting) 202 species of hoverfly, including 180 in his garden. He estimates that in 2014, there were only 25 hoverfly enthusiasts in the whole of Sweden. Stubbs, A.E. and Falk, S.J. (2002) British Hoverflies An Illustrated Identification Guide. Pub. 1983 with 469 pages, 12 col plates, b/w illus.British Entomological and Natural History Society ISBN 1-899935-05-3. 276 species are described with extensive keys to aid identification. It displays 190 species on colour plates. 2nd edition, pub. 2002, includes new British species and name changes. It includes European species likely to appear in Britain. Additional black and white plates illustrate the male genitalia of the difficult genera Cheilosia and Sphaerophoria. Vockeroth, J.R. A revision of the genera of the Syrphini (Diptera: Syrphidae) Memoirs of the Entomological Society of Canada, no. 62:1-176. Keys subfamilies, tribes and genera on a world basis and under regions. ^ a b c d e f g "Hover fly". Encyclopædia Britannica Online. 2009. Retrieved December 5, 2009. ^ a b c d "Hoverfly". Hutchinson Encyclopedia. Helicon Publishing. 2009. Retrieved December 6, 2009. ^ Reemer, Menno (2008). "Surimyia, a new genus of Microdontinae, with notes on Paragodon Thompson, 1969 (Diptera, Syrphidae)" (PDF). Zoologische Mededelingen. 82: 177–188. ^ a b Aguilera A, Cid A, Regueiro BJ, Prieto JM, Noya M (September 1999). "Intestinal myiasis caused by Eristalis tenax". Journal of Clinical Microbiology. 37 (9): 3082. PMC 85471. PMID 10475752. ^ Whish-Wilson PB (2000). "A possible case of intestinal myiasis due to Eristalis tenax". The Medical Journal of Australia. 173 (11–12): 652. PMID 11379520. ^ Barkemeyer, Werner. "Syrphidae (hoverflies)". Biodiversity Explorer. South Africa: Iziko Museum. Retrieved December 11, 2009. ^ Thompson, F. Christian (August 19, 1999). "Flower Flies". The Diptera Site. United States Department of Agriculture. Archived from the original on December 11, 2009. Retrieved December 11, 2009. ^ Philip J. Scholl; E. Paul Catts; Gary R. Mullen (2009). "Myiasis (Muscoidea, Oestroidea)". In Gary Mullen; Gary Richard Mullen; Lance Durden (eds.). Medical and Veterinary Entomology (2nd ed.). Academic Press. pp. 309–338. ISBN 978-0-12-372500-4. ^ Laura Smith. "Syrphidae, hover flies". bumblebee.org. ^ a b Larson, B.M.H; Kevan, P.G. ; Inouye, D. W. (2001). "Flies and flowers: taxonomic diversity of anthophiles and pollinators". Canadian Entomologist. 133: 439–465. doi:10.4039/ent133439-4. ^ Van Der Kooi, C. J.; Pen, I.; Staal, M.; Stavenga, D. G.; Elzenga, J. T. M. (2015). "Competition for pollinators and intra-communal spectral dissimilarity of flowers" (PDF). Plant Biology. doi:10.1111/plb.12328. ^ Haslett, J.R. (1989). "Interpreting patterns of resource utilization: randomness and selectivity in pollen feeding by adult hoverflies". Oecologia. 78: 433–442. doi:10.1007/bf00378732. ^ Sajjad, Asif; Saeed, Shafqat (2010). "Floral host plant range of syrphid flies (Syrphidae: Diptera) under natural conditions in southern punjab, Pakistan". Pakistan Journal of Biology. 42 (2): 1187–1200. ^ Primante, Clara; Dotterl, Stefan (2010). "A syrphid fly uses olfactory cues to find a non-yellow flower". Journal of Chemical Ecology. 36: 1207–1210. doi:10.1007/s10886-010-9871-6. ^ Campbell, Alistair, J.; Biesmeijer, J. C.; Varma, V.; Wakers, F. L. (2012). "Realising multiple ecosystem services based on the response of three beneficial insect groups to floral traits and trait diversity". Basic and Applied Ecology. 13: 363–370. doi:10.1016/j.baae.2012.04.003. ^ Stokl, Johannes; Brodmann; Dafni; Ayasse; Hansson (2011). "Smells like aphids: orchid flowers mimic aphid alarm pheromones to attract hoverflies for pollination". Proc. R. Soc. B. 278: 1216–1222. doi:10.1098/rspb.2010.1770. PMC 3049078. ^ Shi, J.; Luo, Y.B. ; Ran, J.C.; Liu, Z.J. ; Zhou, Q. (2009). "Pollination by deceit in Paphiopedilum barbigerum (Orchidaceae): a staminode exploits innate colour preferences of hoverflies (Syrphidae)". Plant Biology. 11: 17–28. doi:10.1111/j.1438-8677.2008.00120.x. ^ "Diptera: Syrphidae". Landcare Research. Retrieved 2013-08-30. ^ Grosskopf, Gitta (2005). "Biology and life history of Cheliosia urbana (Meigen) and Cheilosia psilophthalma (Becker), two sympatric hoverflies approved for the biological control of hawkweeds (Hieracium spp.) in New Zealand". Biological Control. 35: 142–154. doi:10.1016/j.biocontrol.2005.06.013. ^ Morris, Michael, C. (2000). "Coriander (Coriandrum sativum) "companion plants" can attract hover flies, and may reduce infestation in cabbages". New Zealand Journal of Crop and Horticultural Science. 28: 213–217. doi:10.1080/01140671.2000.9514141. ^ Hickman, Janice, M.; Lovei, G. L.; Wratten, S. D. (1995). "Pollen feeding by adults of the hoverfly Melanostoma fasciatum (Diptera: Syrphidae)". New Zealand Journal of Zoology. 22: 387–392. doi:10.1080/03014223.1995.9518057. ^ Holloway, Beverley, A. (1976). "Pollen-feeding in hover-flies (Diptera:Syrphidae)". New Zealand Journal of Ecology. 3 (4): 339–350. doi:10.1080/03014223.1976.9517924. ^ Campbell, Diane; Bischoff, M.; Lord, J. M.; Robertson, A. W. (2010). "Flower color influences insect visitation in alpine New Zealand". Ecology. 91 (9): 2638–2649. doi:10.1890/09-0941.1. ^ Bischoff, Mascha; Campbell, D. R.; Lord, J. M.; Robertson, A. W. (2013). "The relative importance of solitary bees and syrphid flies as pollinators of two outcrossing plant species in the New Zealand alpine". Austral Ecology. 38: 169–176. doi:10.1111/j.1442-9993.2012.02389.x. ^ Sjöberg, Fredrik (2014). The Fly Trap. Particular Books. p. 197. ISBN 978-1-84614-776-0. ^ Barkham, Patrick (14 June 2014). "Fredrik Sjöberg: 'I realised I had to write my book for people not interested in flies'". The Guardian. Retrieved 15 March 2015. Wikimedia Commons has media related to Syrphidae. "A hover fly, Allograpta obliqua". Featured Creatures. University of Florida / Institute of Food and Agricultural Sciences. This page was last edited on 7 March 2019, at 12:14 (UTC).